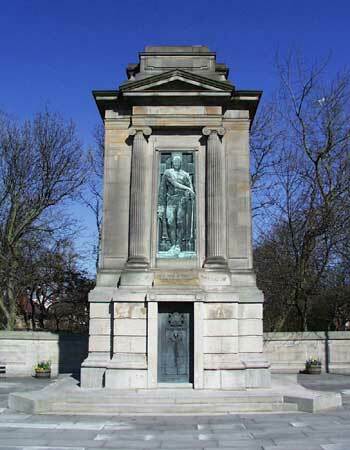 The 1914-1918 War Memorial, Durham Road/Prince Consort Road, Gateshead. Location: Junction of Durham Road and Prince Consort Road, Gateshead. Materials: Sandstone and Bronze. One of the most ambitious memorial ensembles in the region, this monuemnt combines a tall, free standing cenotaph set in paving and backed by a curved and inscribed stone wall which forms the boundary of a small park to the rear. In appearance this cenotaph has nothing in common with the Whitehall Cenotaph designed by Sir Edwin Lutyens. Based on Greek or Roman precedents this sandstone ashlar structure comprises a rusticated ground floor chamber forming a plinth to the pedimented main part of the monument on the south east face of which a heroic-sized bronze relief of a Homeric warrior is framed by columns of an Ionic Order. The chamber originally housed the Roll of Honour of those Gateshead men who were killed in the Great War but was subsequently moved to the nearby public library for safe-keeping. Architect J.W. Spink of Kingston-on-Thames was responsible for the overall design of the memorial while the superb bronze relief is the work of sculptor Richard Goulden with whose statue of St. Michael, outside the church of that name in London's Cornhill, it shares a number of similarities.